First Rate Clotheslines are North Geelong clothesline experts and the exclusive authorised Hills clothesline sales and installation specialists in North Geelong. We sell genuine Hills clotheslines and spare parts and provide professional clothesline installations, repairs and rewires in the North Geelong area. We supply the full range of Hills rotary, folding and retractable clotheslines at the most competitive prices available in North Geelong. Unsurpassed in quality, and with a 10-year Warranty and Free Delivery, we ensure your First Rate Clothesline also comes with peace-of-mind. 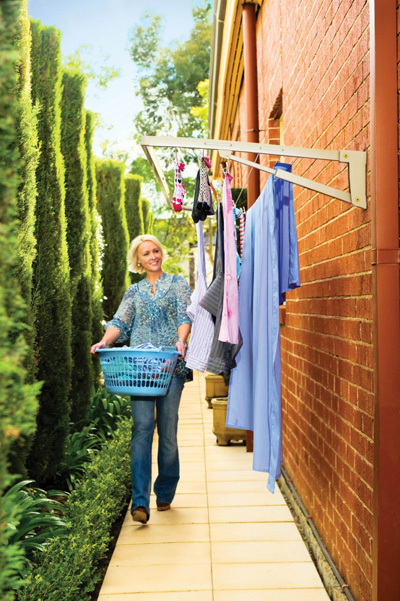 Ranging from traditional to modern designs and with sizes to suit any space in your North Geelong yard or courtyard, our superior quality clotheslines are ergonomically designed, structurally reliable, and competitively priced. From a range of Rotary Hoist, Folding Frame, Retractor and Portable clotheslines and with a variety of options, colours and accessories available, there’s the perfect clothesline for your home in North Geelong. As accredited professionals with a wealth of expertise, we provide genuine service and product support for customers in North Geelong. Our professional installation services are optional with the purchase of your new clothesline from us, and we offer installation services for clotheslines bought elsewhere. Either way, our clothesline installation work is guaranteed. We also specialise in rewiring all Hills Hoists, Austral and Daytek clotheslines, giving your clothesline the most reliability, ease-of-use and longest extension of life. Whether you have a traditional galvanised rotary clothesline, a retracting, folding or portable model, our skillful professionals will do the job right. All galvanised wire line and poly coated filament core lines are top quality and are guaranteed for 12 months. For clothesline re-wires, repairs or spare parts click here. Our highly professional team in North Geelong provide the right advice, expertise and knowledge, to get the most out of your clothesline. And with a showroom accessible to North Geelong, as your local clothesline specialists, we also offer a large range of spare parts for clotheslines and clotheslines accessories, and if a part is not in stock we can order it in for you.